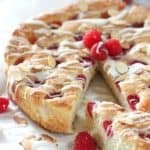 Raspberry Almond Cake – An incredibly easy and versatile cake you can whip up using pantry staples and your favorite berry! One bowl, a few ingredients you probably have in your pantry, and you got cake! I used my recipe for Fresh Strawberry Cake with a few tweaks. Obviously I swapped out raspberries for strawberries…I’ll bet you figured that out. My readers are so smart :). I added some almond extract and lightly toasted almonds sprinkled on top. Look how the raspberries just float on that thick moist batter. You don’t even stir them in, so no worries about a pink tie dyed cake! You can swap out most any of your favorite fruit. Blueberries, peaches, blackberries…yum! Add a big scoop of ice cream while you are at it! I lined my pan with parchment but it isn’t necessary. A good spray of non stick and it will slide right out. (I got a thing about parchment. I use it with most everything. Fear of dirty dishes….). This recipe is for an 8 x 8 pan but I’ve never met an 8 x 8 cake that can’t be doubled into a 9 x 13. 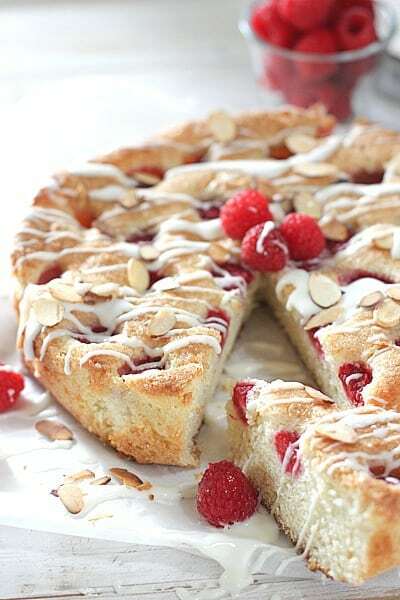 If you don’t have almond extract, sub vanilla and make it Raspberry Vanilla Cake. If you don’t have raspberries use chocolate chips…the combinations are endless! At the risk of being a cake pusher, here are are few of my favorite easy cakes to make…I do love me some cake! and don’t forget my Whiskey Chocolate Cake that is also one bowl easy…with booze! A one bowl easy to make cake using most any berry or extract. The options are endless! Preheat oven to 350 degrees. 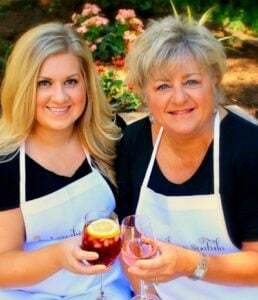 Spray a 10-inch cake pan or 8 x 8 baking pan with non stick or line with parchment . Combine flour, baking powder, and salt together into a medium bowl. Put butter and sugar in the bowl of an electric mixer. Mix on medium-high speed until pale and fluffy, about 3 minutes. Add egg, milk, and almond extract. Mix another minute. Reduce speed to low; gradually mix in flour mixture. Transfer batter to baking dish. 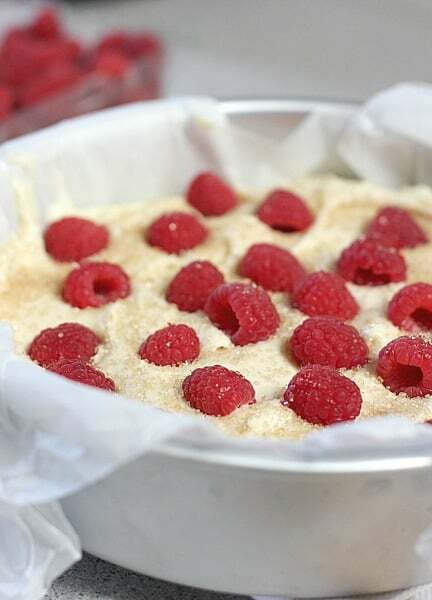 Arrange raspberries on top of batter and sprinkle with optional two tablespoons of raw sugar. Bake until cake is golden brown and firm to the touch, about 40-45 minutes. Allow cake to cool and sprinkle with toasted almonds and drizzle with icing. I made this for the 4th of July and added fresh blueberries along with the raspberries….what a wonderful cake…. So tender and light! After baking & cooling, I put the cake in the fridge because I love how it gives cakes a nice dense consistency. This was a dense and moist cake. Turned out absolutely perfect. Cut into squares & took some to a friend and also shared at work. Everyone loved it. I made this for my family last week, it was delicious! I wanted some more so now I’m making some to bring to work to share with my coworkers after I bragged about how yummy this cake was! Thank you for this recipe! Nice and easy to whip up!